Nowadays VoIP telephony system is rapidly becoming the standard for business communications worldwide. As enterprises are migrating from traditional telephone system to the cost-saving and rich-featured VoIP environment, it is not common to discover that there is still the need to connect their legacy PBX to co-exist with a new IP-PBX, at least for a while, before dismantling such older systems. Most of these older endpoints like fax machines still cannot work reliably through a pure VoIP network. And there may also be instances where it is more cost effective to use an analogue telephone rather than an expensive VoIP phone as an endpoint over a VoIP network. 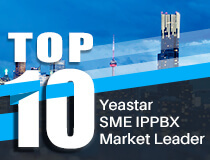 Fortunately, Yeastar MyPBX will give you a favor, which can enable enterprises to benefit from all resources of an IP-based PBX without the necessity of replacing the existing PBX currently installed. MyPBX helps to preserve your original PBX while integrating it into the evolving nature of VoIP communication. No need to replace your old style PBX incurring high costs, you can enjoy a fully functional, Internet-based communications system. As an older PBX is generally limited to a physical number of phone ports, with an IP PBX, new extensions can be easily added. MyPBX supports up to 500 users for organizations of all sizes, offering enterprises to set up more extensions for growing users without complicated phone system wiring. With MyPBX plus flexible modular design, you will not only remain your existing PSTN lines, but also expand VoIP/SIP lines, PRI circuits, or a combination of all of them what you need in your telephony system. External lines can be increased as required. Seamless integration of multiple networks offers route selection and advanced cost control features to ensure each outgoing call at minimal charges. Especially when calls are routed over the Internet, long distance charges can be greatly saved. Both basic call handing features and advance call management features can be enjoyed through integrating MyPBX with a traditional PBX, like IVR, call transfer, queues, conferencing, call recording, and so on. Robust all-in-one features with no extra costs. MyPBX provides FXS or FXO ports for easily connecting your traditional PBX without complicated configuration. Users can easily configure and manage their own services through Web GUI. MyPBX allows you to set mobile phones as regular extensions, which means that all convenient features, preferences and settings available on your desk phone also apply to the mobile extensions. Mobile users can easily handle calls from office extensions and remotely access shared trunk resources, thus making office extensions extremely mobile and flexible. Thanks for your interest. We would suggest you to submit a ticket so that our support engineers can help to give you some advices. Or maybe you can try get help from the community. did you find out how to doit? I submit the ticket have you submit your and find the solution ?